"If we can win one game, shouldn't we try?" Nothing like an inspirational sports movie to make everything better, right? 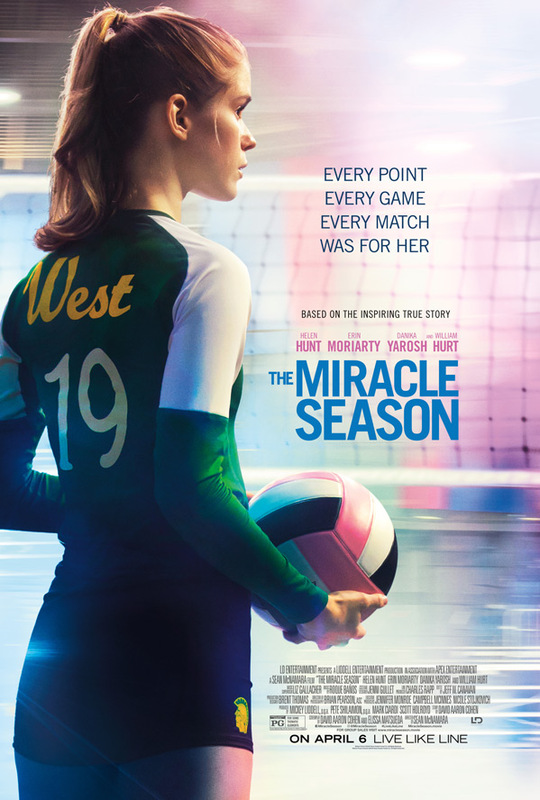 LD Entertainment has debuted a second trailer for a true story movie called The Miracle Season, about a high school girls' volleyball team that had to overcome a tragic loss of one of their players. The cast of the film is lead by Helen Hunt, William Hurt, Danika Yarosh, Erin Moriarty, as well as Tiera Skovbye and Nesta Cooper. The Miracle Season is based on the inspiring true story of West High School girls' volleyball team. In 2011, their star player Caroline Found tragically died in a moped accident, but the team (and town) came together and overcame the hardship to win the season. The story was already profiled on HBO's "Real Sports" series, but this looks like an emotional sports drama maybe worth a watch. You can also still watch the first trailer for The Miracle Season here, to see even more footage from this. Based on the inspiring true story of West High School girls' volleyball team. After the tragic death of the school's star player Caroline "Line" Found, the remaining team players must band together under the guidance of their tough-love coach in hope of winning the state championship. The Miracle Season is directed by veteran American filmmaker Sean McNamara, of the films Soul Surfer, Space Warriors, Bratz, Raise Your Voice, Race to Space, Treehouse Hostage, P.U.N.K.S., and 3 Ninjas: High Noon at Mega Mountain previously. The screenplay is written by David Aaron Cohen and Elissa Matsueda. This has not premiered at any film festivals yet or anywhere else. LD Entertainment will release Sean McNamara's The Miracle Season in select theaters starting April 6th coming up soon. Who's interested in seeing this film?